Interesting find. Well, Apatosaurus is semi-in-the-game due to the "Bronto" skull model. Allosaurus also from a skull model, as well as a weird gray object called "AllyEncounterPivot" (in either case it seems they originally intended Allosaurus over Albertosaurus, then changed their minds). 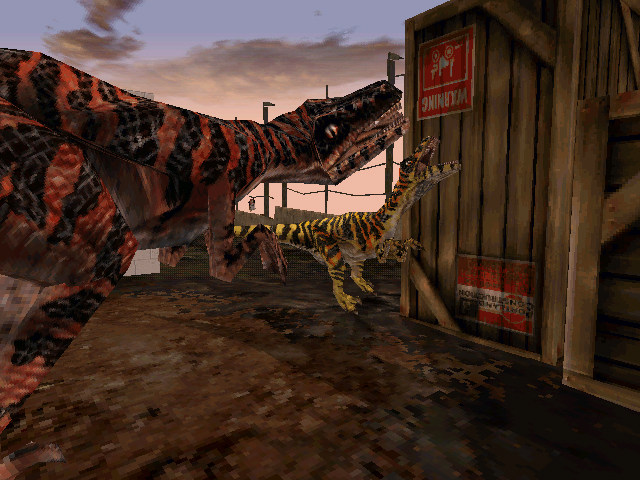 I'm unfamiliar with any Trespasser mention of Dilophosaurus, Utahraptor, or Ceratosaurus. Procompsognathus, I'm not sure it may have been mentioned somewhere. Gallimimus I remember was mentioned. Pteranodon, again not sure. Well, Trespasser's Albertosaurus is based on Steve Kirk's illustration of Allosaurus (the same color pattern, three fingers, etc.). 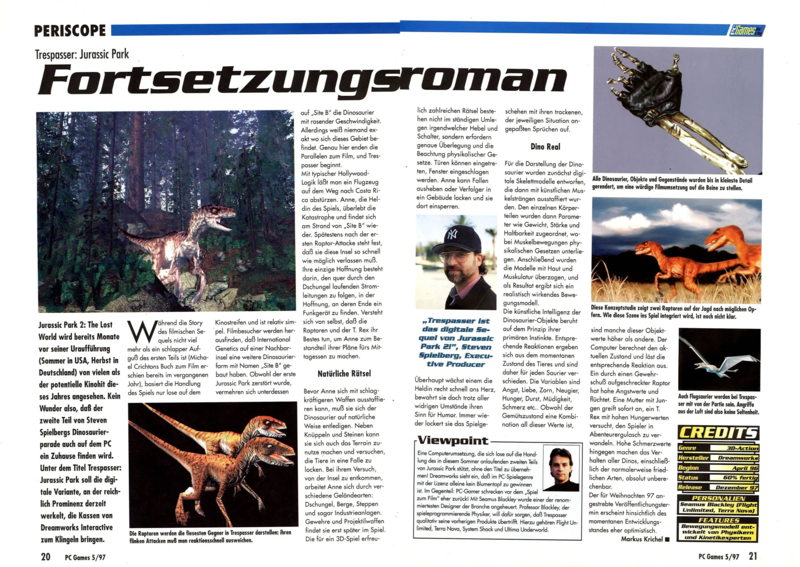 Also I remember that they mentioned in one article something about Pachycephalosaurus and Compsognathus, but Compies were cut out, because there were some problems with their size. Gallimimus, "chicken-mimic." Fastest runner on the island, an eater of insects, eggs, and small mammals. First I just wanna say that Wikia is not totally accurate. It is incomplete, lacks (in a lot of cases) sources and is just overall incorrect with the Trespasser facts. It is nice bringing it up. I am not sure all those dinosaurs are actually canon to Trespasser. Some are, but some we have no clue with, and are probably just taken as canon as they appear on the island in the movies. Actally, I am pretty sure the "AllyEncounterPivot" have nothing to do with a cut dinosaur, the Ally is probably short for Allied and some dinosaurs in the same "team" probably shared that as a stay near object or similar. As you said Draco, some appear to be taken from the JP movie universe. 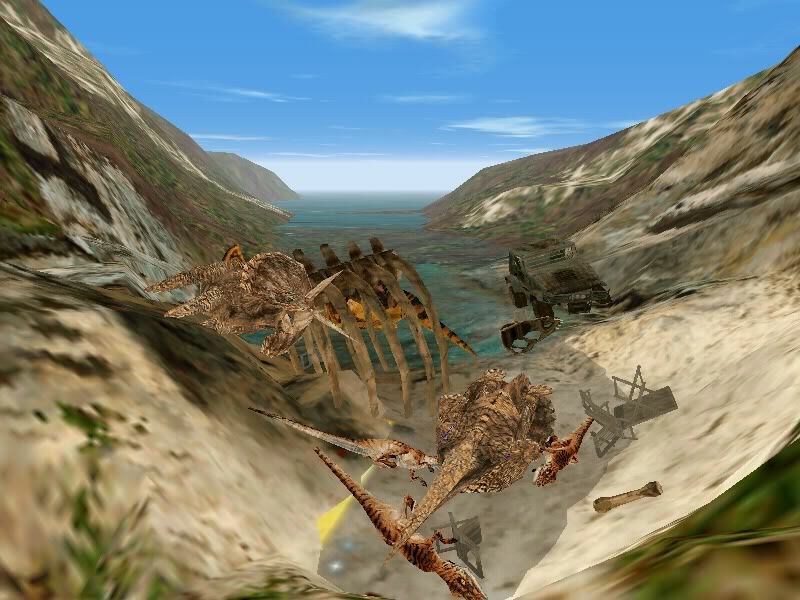 All we know about is that it is named "RaptorCBoss"
However, is it really early and it is possible it is taken from the Lost World Playstation game. In any case, it could be seen as Trespasser canon? tatu is correct when he says that the JP wiki is inaccurate. I try to avoid it entirely as it gives a lot of false information, since it isn't administered as in-depth or cohesively as something like Wookieepedia. Too much fan-theory and speculation mixed in with the facts. To address that list - it's flat-out wrong in some aspects. Apatosaurus - skull and bones are in-game, but no live animal. Not sure whether we have a model of an apato yet? There is a reference to it in Hammond's script, however, so it's possible there were once apatosaurs on Isla Sorna. Allosaurus - skull is an object in-game, no live animal. Allosaur rig was found in early builds though, which probably ended up becoming albertosaurus later on. Dilophosaurus - never even planned to be in-game, no idea where they're getting that information? Maybe they're trying to infer that it should be there since there is that shot of Nedry's jeep in the opening cutscene..? Utahraptor - same as above, maybe confused it with RaptorCBoss? The JP wiki has also referred to as the movie's velociraptors as utahraptors, trying to explain why their size is so off (something JP Legacy also tried to do at least once). Ceratosaurus - same as dilo, never planned. Procompsognathus - not procompsognathus as in the novel, but compsognathus as in the movie was considered. I know the JP wiki has in the past called the movie's compies procompsognathids, but this was again fan speculation since the Robert Bakker character in TLW incorrectly calls them compsognathus triassicus, wheras triassicus is a species of procompy. Gallimimus - was at one point intended to be included, as evidenced by the Hammond script. So I just realized that whoever wrote that may well have thought TC~Isle was Trespasser-canon. It contains a Ceratosaurus, as well as compies and a gallimimus, and pteranodon. Despite the alternate possibilities on some of those I think this here is our source of falsehood. how did you make the Pteranodons? As tatu explained, the pteranodon isn't actually a regular dinosaur (a CAnimal, in technical terms) - it's just an object that looks like a pteranodon, pushed in a circle by a trigger, kind of like the blade of a fan. We have to come up with all sorts of crazy ideas like that when making Trespasser levels since there are some restrictions as to what can be done normally in the engine. I've always considered the RaptorCBoss to be a Utahraptor, that thing is way too big to be a velociraptor, however even I will admit that it isn't clear enough to call it that. It is possible it was a defective clone and grew way past its intended size.